Made from natural Himalayan salt crystals hand mined in the Himalayan Mountains, Accentuations by Manhattan Comfort 7" Himalayan Wired Basket Lamp 3.0 with Natural Rocks brings style and relaxation to your surroundings. Both stylish and relaxing, the lamp is perfect for Office, Bedroom, Living Room and Spa Settings. The loose salt rocker are placed in the wired bowl with a natural round wooden base. The lamp includes a UL approved dimmer power cord. Heating the salt with the included bulb releases negative ions into the air, creating an effect similar to an ionizer, purifying the surrounding air. Calming Amber color is released when lamp is lit. Weight and color may vary due to the natural variation in the Himalayan Crystal Salt. Great complement to meditation routines and also makes a beautiful and unique gift. 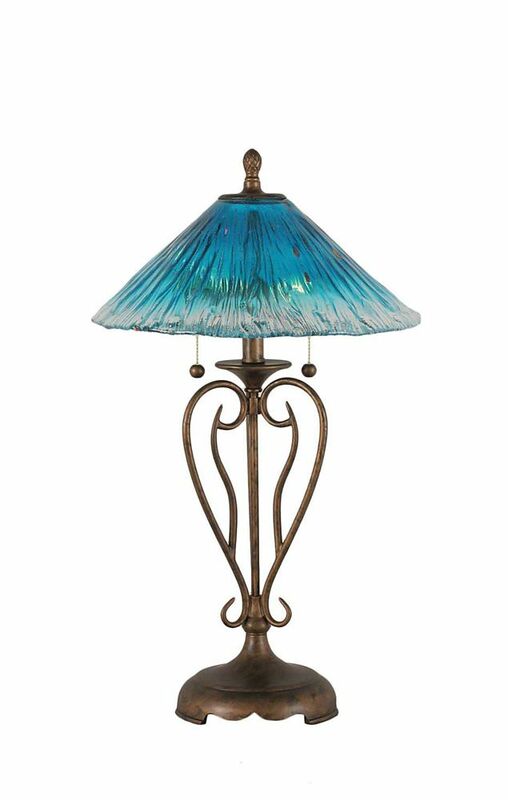 Easily add accent lighting for your patio or garden with this beautiful metal filigree lamp. This table top accent lantern casts a soft, glowing filigree pattern around it. It contains 1 large, bright LED. Easy to assemble. The solar panel charges automatically in the sun. Lighting turns on at dusk and automatically turns off at dawn. Displaying antique gold accents paired with a clear acrylic body, the Column Table Lamp creates distinct modern appeal. Complimented by a white linen shade it features clean lines for a decorative look that rewards your residence with minimalist style and soft, ambient light. Whether you prefer transitional or modern decor, this is the perfect fixture to update any area in your home. Updating the light fixtures in your home is the most effective way to accomplish a striking, yet simple, Do It Yourself (DIY) remodel. Functionality and practicality merge on this sleek all metal cone shade task lamp. This lamp's sleek profile lets you see your task at hand more clearly and its valet tray lets you keep all your belongings, change, watches etc. in one easy to find place. This lamp can be used easily in your home office or kids rooms. Concord 16 in Bronze Table Lamp with a Teal Crystal Glass The cornerstone of the concord Collection is quality, and this traditional table lamp is no exception. Combining a classic bronze finish and posh styling, you will find no better way to highlight the charm of your home. With the superb craftsmanship and affordable price this lamp is sure to tastefully indulge your extravagant side.